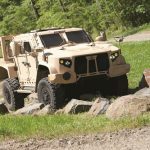 WASHINGTON (Army News Service, Aug. 27, 2015) — Oshkosh Defense was awarded a $6.7 billion contract, Aug. 25, for production of the joint light tactical vehicle, or JLTV. Work will be performed in Oshkosh, Wisconsin. Army Contracting Command in Warren, Michigan, is the contracting activity. Oshkosh was selected over Lockheed Martin and AM General, the latter, which produced the Humvee. 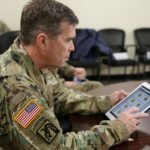 Col. John Cavedo, the former JLTV program manager, said the average unit procurement cost will be below the original $399,000 acquisition report, when all the kits are included, in base year 2012 dollars. The average manufacturing cost per vehicle, minus kits and add-ons, will actually be below $250,000, officials said. Cavedo and others spoke during a media roundtable at the Pentagon, Aug. 25. Scott Davis, program executive officer for combat support and combat service support, said “the first contract was awarded, including a base contract with eight options, to procure the first 16,901 vehicles for both the Army and Marine Corps.” That purchase will include all of the Marine Corps’ 5,500 vehicles through fiscal year 2022. The first JLTVs will be fielded to the Army in fiscal 2018, Davis said. The evaluation process was based on “key performance parameters, key system attributes, cost and secondary technical” requirements, officials said. 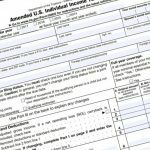 Army funds in the amount of $114,669,605 were obligated at the time of the contract award. It was a firm-fixed-price contract for low-rate initial production of the JLTV and full-rate production with options. Davis said the gap in today’s lightweight vehicle capabilities has meant that commanders often have to choose their vehicles based on payload, performance and protection. The JLTV balances those three things. The JLTV will provide similar protection to one of the mine-resistant, ambush-protected, or MRAP, vehicles – the MRAP All-Terrain Vehicle, known as the M-ATV, which was also developed by Oshkosh Corp. The JLTV will have protection substantially greater than the Humvee, Davis said. 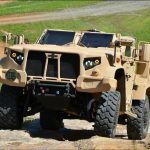 The JLTV will provide this protection with only about two-thirds the weight of the M-ATV, he said, which improves mobility and transportability. Other advantages over the Humvee, he said, are reliability, payload capacity and ease of repair. The JLTV can be transported by CH-47 Chinook and CH-53 Super Stallion helicopters as well as amphibious transport, Davis said. M-ATVs cannot be transported in this fashion. 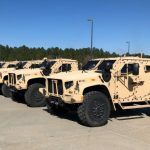 In terms of network connectivity, the JLTV is the first vehicle purpose-built for the network, he said. 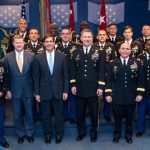 There was a tremendous collaboration between the warfighters and the acquisition community in scoping the requirements to meet affordability constraints and other requirements, Davis said. A lot of discussions took place upfront between the Army and Marine Corps about “harmonizing the requirements.” Cooperation took place throughout the development process, he said. 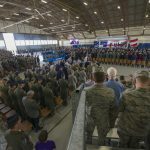 “The biggest winners of this are Soldiers and Marines, who need a new capability to fill a gap in today’s light tactical vehicle fleet,” Davis said. In FY2018, the first Marine infantry battalion will receive 69 JLTVs, Bianca said. They will replace 74 Humvees in the battalion. That battalion was not named.